I talked about this the other day. Twitter bannings and censorship has really ramped up. Last week's first target was Vox Day, the author and controversial alt-right activist. From what I can tell, he suddenly got locked out of his Twitter account without being given a reason, only getting a generic message. Then his followers started reporting that when they tried to tweet links to his blog, they were also getting locked out of their own Twitter accounts, with the message that the ink is malicious and their account may have been hacked so they have to verify their account. Apparently Twitter as since unlocked Vox Day's acccount, but his blog is still un-tweetable, having been tagged as malicious or spam, which it's not. He has asked readers to help get it off the spam list, although he appears to have quit Twitter in favor of Gab. How does this relate to Banned Book Week? Self-published writers rely on self-promotion and social media. They no longer have to pass the gate-keeping standards of publishing houses, but they have to get the word out about their books on their own. So what we are seeing now is that the position of gatekeeping has shifted to the social media companies. And they will use the guise of "safety" to "protect" you, the reader, from wrong-think. Even if it is by tagging sites as "malicious" and "spam' so that you never get to see them. 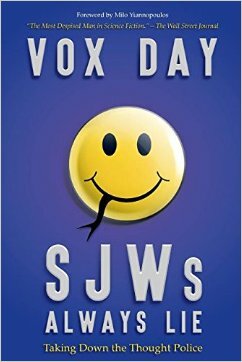 As Vox Day's book title helpfully reminds us: SJWs Always Lie.